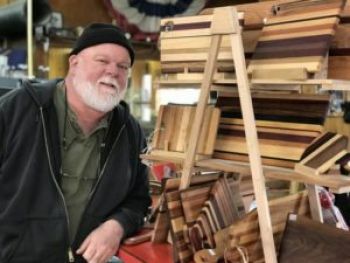 David Shannon with some of his woodwork he does at the family store Cook & Shannon Building Supply in Winchester. A series of issues first believed to be a knee problem kept David Shannon of Winchester running to various medical specialists in sometimes frustrating efforts to find the cause of swelling in his leg and foot. In fact he was in the process of seeking a referral to a northern Indiana city for treatment when someone suggested he see Dr. Bill Spyropoulos DPM with Reid Health. After a couple of visits X-rays and tests to try less invasive treatments Dr. Bill was able to zero in on the problem — a breaking down of bone and cartilage known as “Charcot foot.” The complication is common in patients like Shannon who have diabetes and neuropathy. Left untreated it can be as serious as leading to loss of the foot. Shannon is also pleased that he didn’t have treatment or surgery in Fort Wayne or Indianapolis which were among his options though he was willing to go wherever he could find relief. He said the swelling in his leg was first thought to related to a knee issue. Vasilios Spyropoulos DPM who goes by “Dr. Bill” said Shannon’s breakdown was severe. He said the repair process involved removing bad joints and replacing them back in the correct position using temporary pins and hardware. The healing period starts with no weight bearing and takes at least 90 days to recover. Dr. Bill notes that this complication is on the rise along with the increase in diabetes in the population; and said that Charcot foot is often misdiagnosed as conditions such as cellulitis or a blood clot.